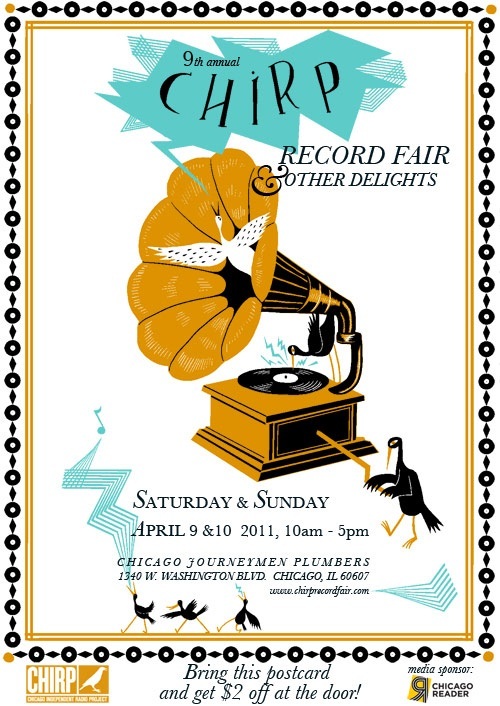 CHIRP, Chicago’s all-volunteer independent radio station, is hosting its 9th annual record fair this Saturday and Sunday at the Chicago Journeymen Plumbers Union, 1340 W. Washington, from 10-5 each day. Well, my lovely friends, let me give you some reasons. There’s more than just vinyl, which is so retro that it’s back in again. There are tons of dealers with CDs and, yes, even cassette tapes. All we need now is for someone to be there, hawking their wares as FLAC files on USB drives, and we will be all set. If you’ve gone Completely Digital, there are still vendors there to amuse you. Gig posters, postcards, t-shirts, zines, artwork, and other delightful non-music-making items are for sale from vendors including Renegade Handmade, Studio 678, and Trailer Trish. Live music and DJ sets all day, every day. Artists and DJs include Darling, the Soul Summit DJs, Blue Ribbon Glee Club, and Daniel Knox. You’ll be supporting the local music scene! The record fair is a big fundraiser for CHIRP, and many local labels will be there, including Addenda/Plustapes, Grape Juice Records, HoZac Records, and Touch and Go. I’ll be there! (Clearly, this is the best reason.) Stop by on Sunday between 2:30 and 5, and I’ll be one of the smiling faces taking your money as you enter. Admission is $7, but if you print out this handy flyer — or bring in any advertisement for the record fair — you can get in for $5. Not all vendors take credit cards, so make sure to have some Actual Paper Money on hand. 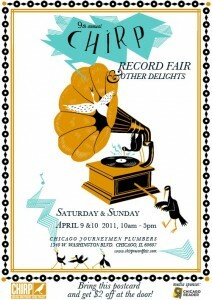 Come on out and support CHIRP, local music, and your crippling vinyl addiction.